At the Women’s World Championship no fan will be thirsty, because our beverage partner Stiegl brewery will take care of that. Recently, the cooperation agreement with the Brewery from Salzburg was signed in Linz. Stiegl takes care of the entire handling of the drinks and supplies Stiegl Goldbräu, Stiegl Radler as well as all soft drinks. “We are very pleased to welcome such a renowned and wellknown company as Stiegl as a partner of the World Championship. Stiegl has worked hard for us from the beginning and provides us with a comprehensive package. 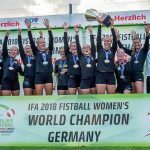 Nobody will definitely stay thirsty at the fistball event”, said General Secretary of the Organizing team, Christoph Oberlehner.